The FP-5L offers the most state of the art fuel safety features and fuel management in the industry. Managing fuel is critical for every flight and Electronics International’s FP-5L manages fuel better than any other competitor. 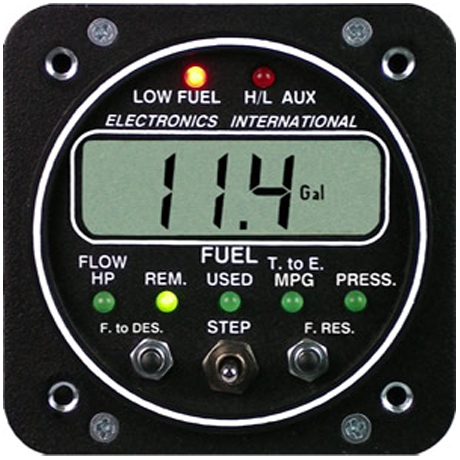 Since forgetting to check fuel level is not uncommon occurrence among pilots, the FP-5L's pilot programmable alerts and displayed functions will transform the task of managing your fuel. These alerts catch your attention by blinking the Low Fuel LED and by setting these alerts the FP-5 becomes a Fuel Managing Co-Pilot, alerting you when it is time to check your fuel levels, switch tanks, check your flight plan or perform any other function you deem necessary. 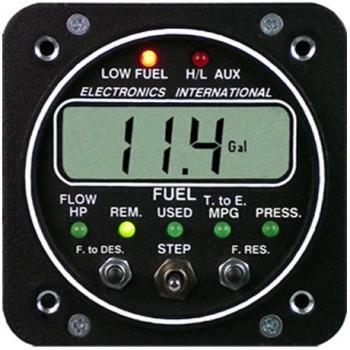 Another primary feature of the FP-5 is a Pilot Programmable Low Fuel Warning. In order to catch your attention, this feature blinks the Low Fuel LED which will turn solid red when acknowledged by pushing any button or switch. This warning is an emergency warning, similar to those on other fuel flow instruments, but it is pilot programmable from the front panel at any time. 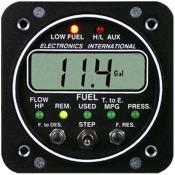 To further manage your fuel and provide safety the FP-5 displays fuel pressure in .2 PSI increments to 100 PSI. In addition it offers one Pilot Programmable Low Fuel Pressure Warning and one Pilot Programmable High Fuel Pressure Warning. Example: If you develop a fuel leak (common with old fuel lines, sector pumps and carburetors) the fuel pressure will drop but will not go to 0 PSI. The engine will continue to run at idle or low RPM. On take-off there will not be enough fuel to keep the engine running or it will run very lean causing extensive damage to the cylinders. The FP-5 can detect this problem easily and alert you before take-off. This is done by programming the Low Fuel Pressure Warning to a level just below the normal operating level for your aircraft.